How do I add hidden fields? Hidden fields do not show on the page. Therefore the visitor can't type anything into a hidden field, the purpose of the field is to submit information that is not entered by the visitor. With Wishpond it is most commonly used with our pre-fill fields so that it auto-submits information from the URL to your analytics on the information you want to collect from your users without having to ask for it. Once you click on your entry form you will see the option to add a hidden field. Click on “Hidden Field” and you will be brought to the field settings. 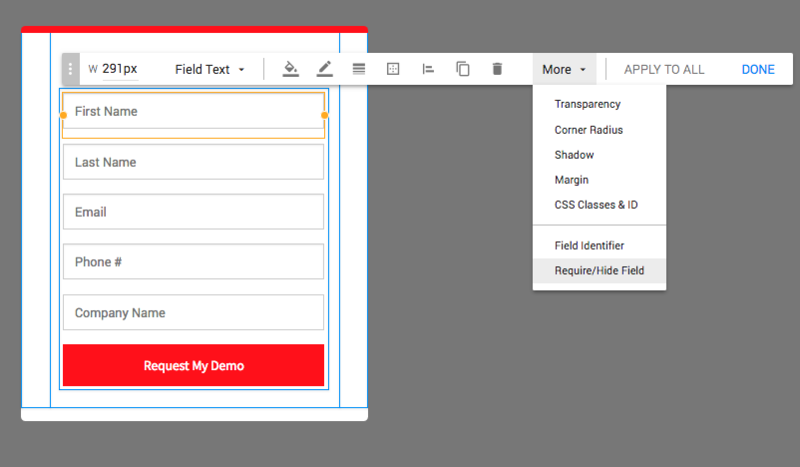 By clicking hidden field it will add it to the form automatically. Next you need to add the field label (this is to help organize the analytics that you collect, they will not see this field name). Most of the time you can leave the default value blank and add the value into the pre-fill URL (shown in the next steps). For example, if you want to track which sources your participants are coming from, like Facebook, Twitter or LinkedIn you can label your field “source”. Then click pre-fill fields at the top. Make sure to enable the option highlighted below to “auto-submit form if all fields are filled”. The URL string shown below is what you will use to promote the campaign. In this example you need to change the value of “source=add_value” in the URL to the source you post the campaign on. In this example you need to change the value of “add_value” in the URL to the source you post the campaign on, like Twitter, Facebook or Google+ because I want to see which source my particpants are entering through. This is what the entry form will look like live, but since they are entering through the url with the string "source=twitter" it will automatically add that to the analytics a collect about that entry that they entered my campaign through Twitter.